The Motorola Moto G4 Play features a 5 inch HD touchscreen display with a resolution of 1280 x 720 giving a pixel density of 294ppi. 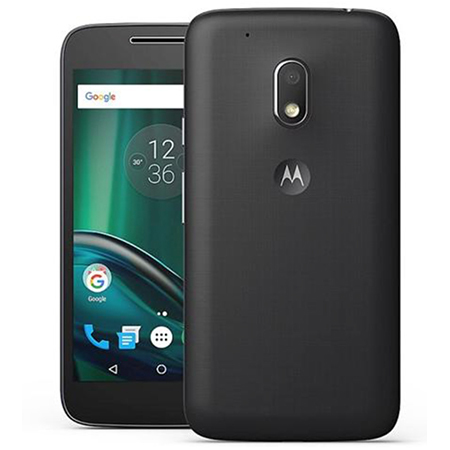 The Moto G4 Play features an 8 megapixel rear camera with f/2.2 aperture and LED flash for crystal clear photos every time. With this device you can tap anywhere to capture the shot. Other features include 4x digital zoom, burst mode auto HDR and Panorama. The front camera is a 5 megapixel sensor again with f/2.2 apertures and display flash for stunning selfies. You can also capture video at 30fps in 1080p. The Moto G4 Play measures 144.4 x 72 x 8.95-9.9mm and weighs in at 137 grams. The device comes with a water repellent nano-coating giving the device water protection. The device has large bezels at the top and bottom with a 66.3% screen to body ration. The device comes with a powerful Qualcomm Snapdragon 410 processor with a quad-core CPU and 2 GB of memory to easily switch between apps. With android 6.0.1 Marshmallow OS, the device comes with 16GB of internal memory which is expandable up to 128GB with microSD support. The G4 Play features an all day 2800 mAh battery, Bluetooth v4.1 LE, GPS and Wi-Fi.